This tutorial is the second in a two-part series on hosting Windows Communication Foundation (WCF) services. In the previous tutorial (Hosting Windows Communication Foundation Services), you explored the role of the service host and reviewed your options for hosting WCF services. You then hosted WCF services using Internet Information Services (IIS) and Windows Process Activation Service (WAS). In this tutorial, you will see how to host WCF services in a console application and to host WCF services. This is known as self hosting. You can use the same techniques to host WCF services in a Windows service, a Windows Forms application or a Windows Presentation Foundation application. In order for clients to call a WCF service, you must host the service in a runtime environment. The role of the host application is to start and stop the service, listen for requests from clients, direct those requests to the service and send responses back to the clients. To host a service, the host application uses the ServiceHost class in the System.ServiceModel namespace. The application uses this class to instantiate the service, configure endpoints, apply security and start listeners that handle requests from clients. One of the benefits of hosting a WCF service using IIS or WAS is that each automatically creates an instance of the ServiceHost class when a client calls the service. You simply need to specify what service the host should activate. You do this in a .svc file by setting the Service property of the ServiceHost directive. The endpoints are defined in the Web.config file. If you self-host a service, you must create an instance of the ServiceHost class and configure it in code. You can then define endpoints in code or in a configuration file. You will see how to take these steps in this tutorial. The service has a method to retrieve product information. The method returns an instance of the Product class, which has properties for ProductId, ProductName and UnitPrice. The service has methods to retrieve and update inventory information. The GetInventory method returns an instance of the Inventory class, which has properties for ProductId, UnitsInStock and UnitsOnOrder. The UpdateInventory class receives an instance of that class and returns a Boolean indicating whether you successfully saved your changes. 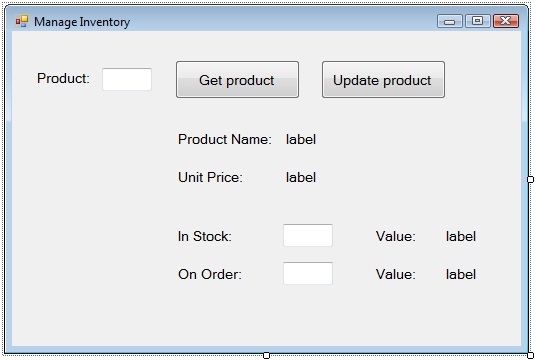 The WindowsClient project contains the Manage Inventory form (see Figure 1). When the user clicks the Get product button, the form will call the GetProduct method of the ProductService service to retrieve the product name and price. The form will also call the GetInventory method of the InventoryService service to retrieve the units in stock and on order. When the user clicks the Update product button, the form will call the UpdateInventory method of the InventoryService service to update the units in stock and on order. Figure 1. Use this form to call the WCF service. In this section, you will create a console application to host these WCF services. You will then write code to call the services from the form. You will typically not use a console application in production, but it is an easy and convenient way to host WCF services during development and testing. In the Solution Explorer, right-click the SelfHostingServicesDemo solution and select Add | New Project to display the Add New Project dialog box. Select Console Application in the Templates list. Name your project ConsoleHost. Click OK. Right-click the ConsoleHost project and select Set as Startup Project. Right-click the ConsoleHost project, and select Add Reference from the context menu. 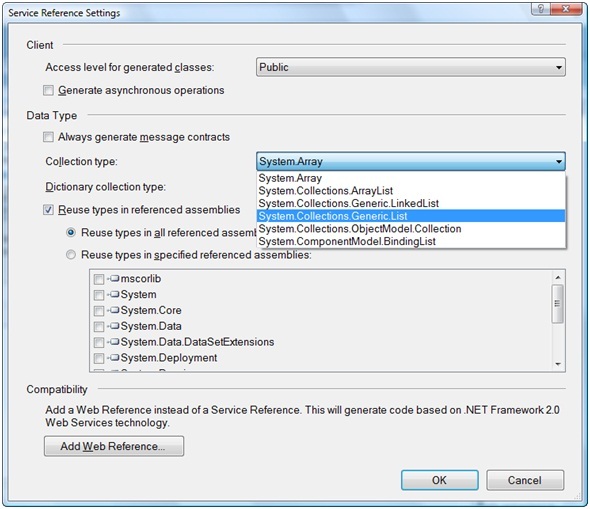 In the .NET tab of the Add Reference dialog box, select System.ServiceModel. Click OK to add the reference to the assembly that contains the WCF classes. Right-click the ConsoleHost project, and select Add Reference from the context menu. In the Projects tab of the Add Reference dialog box, select InventoryServiceLibrary and ProductServiceLibrary. Click OK to add the reference to the two services. In the code above, productHost is an instance of the ServiceHost class. This class has several constructors. The one you used takes the type of service as a parameter. To host a service you need to define one or more endpoints. In the code above, you used the AddServiceEndpoint method of the ServiceHost class. This method has several overloads, but all of them take as parameters the three components of an endpoint: contract, binding and address. In the code above, you are hosting the service using TCP and an address of net.tcp://localhost:9010/ProductService. When you call the Open method of the ServiceHost class, the host starts listening for client calls. When you call Close, the host stops listening. The code above calls the Abort method if the host faults. The field productEndpoint is an instance of the ServiceEndpoint class in the System.ServiceModel.Description namespace. This field represents the endpoint you added using AddServiceEndpoint. After the host starts, the code displays the address and the binding the host is using. Save your changes and build the solution. Press F5. 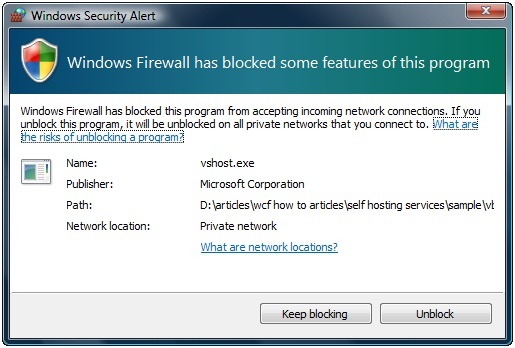 You may see a Windows Security Alert (see Figure 2). Click Unblock to enable the service host to listen for client requests over TCP. Figure 2. Click Unblock to enable the service host to listen for requests. Press any key to stop the service. You may have noticed the WcfSvcHost popup and two WCF Service Host icons in the Notification Area. You have WCF services in the same solution as your host. Therefore, when you run the application in debug mode, Visual Studio automatically starts an instance of the WCF Service host for each service. To avoid this, you can start the application by pressing Ctrl+F5. The console host application now hosts two services, one communicating using TCP and the other communicating using HTTP. Press any key to stop the service. The next step is to call the WCF services from the client application. In the previous tutorials in this series, you added service references at this point. You will see later on how to do that. For now, you will take a different approach. Right-click the solution and select Set Startup Projects to display the Solution ‘SelfHostingServicesDemo’ Property Pages dialog box. Select Multiple startup projects. Select Start from the Action drop-down list for the ConsoleHost and WindowsClient projects. Click OK.
Right-click the WindowsClient project, and select Add Reference from the context menu. In the .NET tab of the Add Reference dialog box, select System.ServiceModel. Click OK to add the reference to the assembly that contains the WCF classes. Right-click the WindowsClient project, and select Add Reference from the context menu. In the Projects tab of the Add Reference dialog box, select InventoryServiceLibrary and ProductServiceLibrary. Click OK to add the reference to the two services. Clients and services communicate by passing messages across a communication channel. The ServiceHost object in the host application automatically creates the necessary channels. Clients must also create channels to communicate with the host. In the previous tutorial, you added a service reference and that creates a proxy class. The proxy class wraps a channel the client can use to communicate with the service. Later in this tutorial, you will see how you can use such a proxy class to communicate with a self-hosted service. As an alternative to using a proxy class, you can use the ChannelFactory<T> class, where T represents a service contract. To create the channel, you call the CreateChannel method and pass a binding and address. The CreateChannel method returns a channel which has methods corresponding to the service’s operations. Save your changes and build the solution. Press Ctrl+F5 to run the application. Wait for the console window to indicate the two services are running. 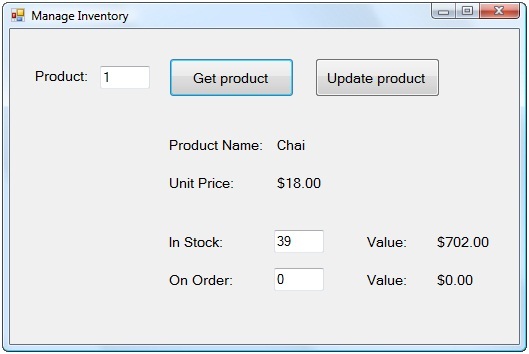 In the Manage Inventory form, enter 1 in the Product text box and click Get product. The form calls the GetProduct method of the ProductService WCF service and retrieves the product’s information. The form then calls the GetInventory method of the InventoryService WCF service and retrieves the inventory information (see Figure 3). Figure 3. You called two WCF services to retrieve product and inventory information. Enter 10 in the On Order text box and click Update product. Dismiss the dialog box informing you your changes were saved. Close the form. Press any key in the console window to stop the services. Save your changes and build the solution. Press Ctrl+F5 to run the application. In the Manage Inventory form, enter 1 in the Product text box and click Get product. You should see the product and inventory information you saw previously. Enter 20 in the On Order text box and click Update product. Dismiss the dialog box informing you your changes were saved. Close the form. Press any key in the console window to stop the services. If you are hosting a WCF service using IIS or WAS, you define endpoints in a Web.config file. You saw how to do this in the previous tutorials in this series. If you are hosting a service in a managed application, you can define endpoints in code, as you just did, or in a configuration file. Defining endpoints in code gives you complete control over them. However, all changes to an endpoint require you to rebuild the application. If you define endpoints in configuration files, you can change them without rebuilding. This is more flexible and is typically the approach you will take. For this part of the tutorial, open the SelfHostingServicesDemo2 solution that is included in the tutorial’s download. This solution is a copy of the completed version of the SelfHostingServicesDemo solution. This XML defines the same endpoints you previously defined in code. Save your changes and build the solution. Press Ctrl+F5 to run the application. Confirm that the console window displays that the services are hosted as before. At runtime, the ServiceHost object first checks for a configuration file. If there is one and it contains endpoint definitions, the ServiceHost object uses those. Note that if you have also defined endpoints in code, those endpoints would override the ones defined in the configuration file. Close the form and press any key in the console window. In this code, rather than specify the binding and address, you reference an endpoint in the configuration file. Enter 10 in the On Order text box and click Update product. Dismiss the dialog box informing you your changes were saved. Close the form and press any key in the console window. In the previous tutorial, you added a service reference to WCF services hosted in IIS and WAS. Visual Studio then created a proxy class you could use to communicate with the services. In this section, you will configure the self-hosted WCF services to support service references. When you add a service reference, Visual Studio sends a request to the service for metadata. That request uses the WS-MetadataExchange standard protocol. By adding the endpoints above, these services now support the metadata query. The service behavior ServiceBehavior1 specifies that the ProductService service will respond to metadata requests that come via TCP .. The service behavior ServiceBehavior2 specifies that the InventoryService will respond to metadata requests that come via TCP and HTTP. Notice that the XML above adds a base address below the endpoint that uses themexHttpBinding. This is required for clients that will retrieve service metadata over HTTP. Return to Visual Studio. If you are using Visual Basic, select the project and click Show All Files. Expand the References node in the WndowsClient project. Delete the references to InventoryServiceLibrary and ProductServiceLibrary. Delete the app.config file. Note that you could use both a channel and a proxy class in the same project to communicate with services. However, here you are switching from using a channel to using a proxy class so it is cleaner to remove the references to the services and the existing configuration file. Next you will be adding a service reference to both services. In order to do that ConsoleHost.exe must be running. Open up a new command prompt with Administrator privileges and run ConsoleHost.exe In the Solution Explorer window, right-click on the WindowsClient project and select Add Service Reference to display the Add Service Reference dialog box. Enter net.tcp://localhost:9011/mex in the Address text box and click Go. In the Services pane, select ProductService. Expand the ProductService node and select IProductService. You should see the available operations/methods in the Operations pane (see Figure 4). 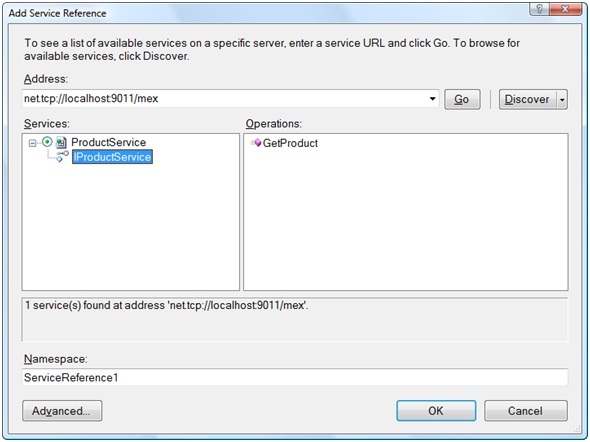 Enter ProductService in the Namespace text box and click OK. Figure 4. Select the WCF service that you want to use. Add a second service reference for the other service. Enter http://localhost:8080/mex in the Address text box and click Go. 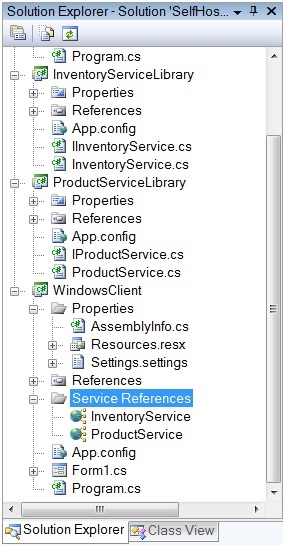 In the Services pane, select InventoryService. Expand the InventoryService node and select IProductService. Enter InventoryService in the Namespace text box and click OK. You should have two service references in the WindowsClient project (see Figure 5). Figure 5. You have added service references to two self-hosted WCF services. In the getProductButton_Click method, replace inventoryChannel with inventoryProxy and productChannel with productProxy. In the updateProductButton_Click method, replace inventoryChannel with inventoryProxy. Enter 20 in the On Order text box and click Update product. Dismiss the dialog box informing you your changes were saved. Close the form and press any key in the console window. To communicate with a service, you can add a service reference and use a generated proxy class or you can use the ChannelFactory class. Both create channels and both supply methods for each service operation. It is more convenient to add a service reference and use the generated proxy class. This is also your only option if you don’t own the service code and therefore can’t add references to the service’s assemblies. A benefit to using the ChannelFactory class is that you are guaranteed that you use the same object model as the service. You may find scenarios where the generated proxy class does not use the exact same object model. For example, by default the generated proxy class uses arrays for collections, even if the service uses generic lists. In that case, you should click the Advanced button in the Add Service Reference dialog to display the service reference settings. You can then specify that you want to use lists (see Figure 6). Figure 6. Use this dialog to control how the proxy class works with collections. In this tutorial, you explored self-hosting WCF services. You saw how to create an instance of the ServiceHost class in code and to start listening for client requests. You saw how to define endpoints both in code and in configuration files. You also saw how to configure the client to communicate with the service, both using the ChannelFactory class and generated proxy classes. You used a console application to host services here. In production, you would use a Windows service. You would put the code to create the ServiceHost object and call the Open method in the OnStart method of the Windows service. You would put the code to call the Close method in the OnStop method of the Windows service. At this point in the tutorials, you have covered the basics of building, hosting and calling WCF services. In the next several tutorials, you will explore WCF services in more depth and detail.